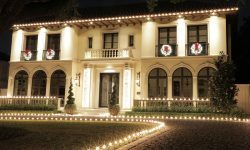 In the third part of this multi part how-to Christmas electrical series, we're going to be taking a look at how to know if you have enough electrical infrastructure for your Christmas lights and decorations. In the previous two parts we reviewed understanding watts and amps. We also looked at how to measure the amount of electricity your Christmas lights are using. Once you have a basic understanding of watts, amps and how to measure them, you're ready to take a look at your circuits and extension cords to make sure they are up to the task of safely supplying enough power to light up all your Christmas lights and decorations. 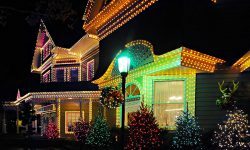 Electrical infrastructure for Christmas lights and decor can be broken down into two types: permanent and temporary. Permanent includes your outlets and circuit breakers. Temporary infrastructure includes any cords, power strips or timers that you put into place which is not hard wired into the main electrical system. Let's take a closer look at these two types of electrical infrastructure. When it comes to permanent infrastructure, you will be dealing with outlets and circuit breakers. Outlets are generally either 15 amp or 20 amp. 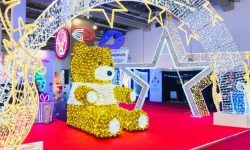 When it comes to circuit breakers, there can be a wider variety of amperages available, but generally most breakers that you will be using for Christmas lighting and decorating will be either 15 amp or 20 amp. In some commercial applications, you may find 30 amp breakers used. 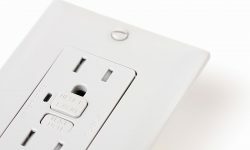 As the above image shows, you can distinguish between a 15 amp and 20 amp outlet by the side cut the 20 amp outlets have. As the above image shows, the amperage on most breakers is printed on the end of the trip switch. The number shown is the maximum amperage the breaker is designed to hold. It's important to note that just because a breaker is rated for a specific maximum number of amps, that doesn't mean that it should be pushed to this limit on a long term basis. Code requires that you never exceed 80% of the maximum load capacity of a breaker. So for a 15 amp breaker, your total load should not exceed 12 amps, a 20 amp breaker maximum is 16 amps and a 30 amp breaker is 24 amps. Knowing the maximum amperage allowed for a breaker is not the only consideration when figuring how much you can plug into a circuit. You'll also need to know if there is anything else currently being powered by that particular breaker. Unfortunately this is not always easy. Ideally, your breakers should be well labeled and breakers that go to the outlets you will be using to power up your Christmas lights and decorations should not control anything else other than the outlets. But unfortunately this may not always be the case. 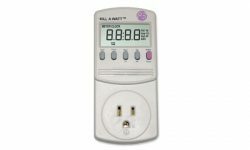 If you find yourself in a situation where you are dealing with old electrical or a system that may not have been installed to code, it's probably best to have an electrician come out and not only make sure everything is safe, but also to help you identify what breakers go to what lights, outlets, etc and what the current load is on each of the breakers. While it is possible to use a clamp meter to measure the amount of load each breaker is carrying directly at the breaker panel, this is generally not something that an average homeowner should do since it involves removing the faceplate of the breaker panel. If your breakers are correctly wired and the outlets are on dedicated breakers, then it is relatively easy to determine what outlets go to what breakers. Simply plug a set of lights into each outlet and then begin flipping off breakers. Each time you flip a breaker, walk around and see what light sets are no longer working and that will tell you what outlets are controlled by that particular breaker. In the event that you have something else that is being powered at one of the outlets, use your clamp meter as described in Part 2 of this series and measure the amperage draw of that device. Whatever it is drawing should then be taken into account when determining how much you can load up on that particular circuit. We generally recommend staying at least 10% under the maximum rating for extension cords, temporary timers and power strips. It's always better to be on the safe side rather than taking a chance and overloading a cord. Remember that breakers are designed to trip when they get overloaded, but when an extension cord is overloaded, it will simply begin to melt and may flare up and cause a fire. Once you know the maximum amps both your permanent as well as temporary electrical infrastructure can hold, you are then ready to get busy lighting and decorating. Be sure and keep your clamp meter and line splitter handy so you can make sure all your cords are under their maximum rating. If you are plugging multiple cords into an the same outlet or power strip, be sure and add up the amperage of all the cords to make sure they don't exceed the maximum allowed amperage of that device. Also have a notebook available so that you can track what cords are going into each circuit. Need a refresher on how to use a clamp meter? Be sure and see our previous blog posting that covers using a clamp meter and a line splitter. 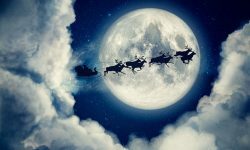 Christmas electrical may not be the most interesting topic, but by having a good understanding of a few basic fundamentals, your lighting and decorating projects will go off without a hitch and having tripped breakers and overheated cords will be a thing of the past.